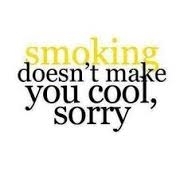 All of my friends smoked, so why shouldn’t I? Most people around me did as well. The media didn’t really portray it to be a bad thing either. Lighting up a cigarette felt so relaxing, so soothing to me. I had one after dinner, first thing in the morning with my tea, when I was stressed out, and even when I was bored. 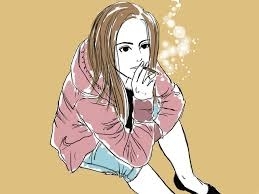 When I found out that I was pregnant, I tried my best to quit smoking. I did not have the will power. Every time I lit up though, I felt guilty and wondered what kind of side effects I may have from not quitting. 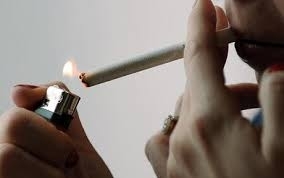 When I realized how my cigarettes were controlling my life, it made me angry. Not only did it make me angry though… I felt disappointed in myself for allowing it to get to that point. I did not plan ahead when I quit. I just decided that I would do it. I broke free from my addiction, and I feel AMAZING! I am 8 months smoke free now. And I could not be happier I took the step to quit. In eight hours, excess carbon monoxide is out of your body. In five days, most nicotine is out of your body. In one week, your sense of taste and smell improves. 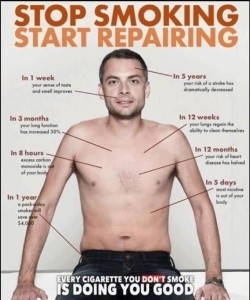 In twelve weeks, your lungs regain the ability to clean themselves. In three months, your lung function has increased by 30%. In twelve months, your risk of heart disease has halved. 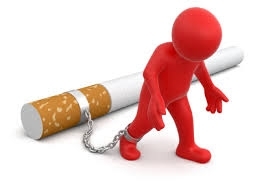 In one year, a “pack a day” smoker will save over $4,000. In five years, your risk of stroke has dramatically decreased.